Katsushika Hokusai (October 31, 1760 - May 10, 1849) is a type of figure who seems to recur again and again among great artists of all times and places: a compound of enormous vitality, longevity, impatience with the demands of conventional society, and eager questing after new styles to convey that something within the individual that clamors for expression. Considering the length of his life, we know little enough about him. Yet compared with, say, his great contemporary, Sharaku, he is well documented. We have large body of work more or less accurately dated, a considerable number of his own writings, many contemporary references, and a mass of anecdote which, however suspect, by its very existence tells us something of the man. 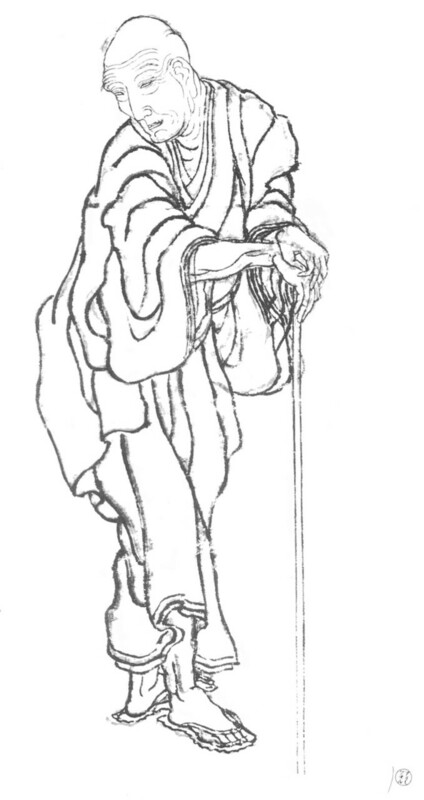 If Hokusai as a human phenomenon reminds us of certain figures in the art history of other countries, there is also something familiar about the age in which he lived. From time to time, it seems, something ordains that in certain country a certain art form shall enjoy a golden age - that there shall emerge in a short spaces of time, not one but many geniuses or near-geniuses who bring it to a perfection never known before and never after surpassed. The Japanese print in the latter half of the eighteenth century and the early nineteenth century enjoyed just such an extraordinary flowering. Hokusai's life spanned almost the whole of that golden age. His art progressed in gradual stages from imitation of others to mature independence and the development of new forms, then went on to new heights while the form itself was lapsing into decadence, and finally survived to see itself become old-fashioned in its turn, and to be superseded. Hokusai's series of woodcut prints entitled "The Thirty-six Views of Mt. Fuji" is generally held to be his masterpieces; quite possibly, it has been more widely acclaimed throughout the world, and had more influence on Western artists, than any other work of Japanese art. Publication of individual prints in the series is believed to have begun around 1823, and seems to have been completed around 1831. There are, in fact, forty-six prints in all, then further prints having been added to the original series around 1831. Hokusai may have intended to continued the series still further, but he was already an old man, and he seems to have been discouraged by the popularity that a fickle public was according to Hiroshige's newly published series, "Scenes of life in Edo" and "The Fifty-three Stations on the Tokaido." There is no clue to the original order of publication within the series, though what appear to be the ten additional works are distinguished by the use of black lines instead of the dark-blue lines used in all the rest. Some prints obviously represent a greater artistic maturity than others, and - as is only to be expected in such an extensive work - there are comparative failures among them, but the collection as a whole maintains an extraordinarily high level, and includes a number of prints generally acknowledged as masterpieces. Even those works that have been comparatively neglected often repay close study by yielding up unexpected beauties. With the exception of two or three works that deal exclusively with Mt. Fuji, all the prints show the mountain as seen from various points, some near, some far, in the neighboring provinces. In most prints, the exact spot is more or less identifiable from the title. In many cases, however, Hokusai used the actual view as the merest pretext for creating landscapes of his own in which, by including scenes of life in the country and the city of Edo, he also explored the relationship between man and his natural environment. Nowhere is this virtuosity more apparent than in the famous Great Wave Off Kanagawa, one of the works that most astonished Western artists of the nineteenth century when Hokusai's work first swam into their ken. This particular print, in fact, sums up many of the most individual characteristics of the series as a whole. It is a good example of the "circle-and-triangle" composition. It bears eloquent witness to the almost demonic energy that possessed Hokusai and that he saw at work in nature all about him. It shows the effective use of simple color that was such a revelation to artists in the West. And it is an interesting case of the special relationship between the human element and nature that exists throughout "The Thirty-six Views of Mt. Fuji." In its intrinsic interest, the human element in the prints parallels and rivals that of the landscape aspect. Almost all the "Thirty-six Views" contain human figures shown engaged in various activities. The prints are, in a sense, intensely theatrical: the figures are on a stage, as it were, and the natural scene is carefully stage-managed by the artist so as to provide a perfect setting for them. Yet it never becomes a simple background. Nor, on the other hand, do the figure ever serve merely to provide a point of focus in the scene. Never, as in early Yamato-e landscapes, are they mere lifeless puppets incorporated as part of an overall effect. On the contrary, they have magnificent, unbelievable life of their own that is as much a raison d'etre for the works as the landscapes themselves. One only needs to glance at the many volumes of Hokusai's Sketchbooks that preceded the "Thirty-six Views" to realize the intense interest he felt in the human body, whether at rest or in motion, and the extraordinary energy with which he studied it. As a result of long years of practices, he acquired a feeling for the movements of the human body, and for the emotional significance of particular postures or gestures, together with a remarkable ability to convey a sense of life, or a particular attitude of facial expression, with the utmost economy of line. Nowhere is this ability seen more clearly than when he depicts human figures moving in the distance. The extreme smallness of the figures allows for no detail at all - yet even so, they are as full of life and motion as any of his larger figures. The attitude Hokusai expressed toward his human figures is another characteristic that sets him apart from other artists of his day. In the "Thirty-six Views," the artist succeeds in identifying himself completely with the common people - not only with the merchants and artisans of the towns, but with the poor people of the country, living their lives out in the hills and fields far from the sophisticated comforts of the city. He show them with humor and with entirely unsentimental sympathy that can be very moving. Above all, they are alive; even when a face is hidden a large hat, one feels that Hokusai has portrayed a real human being with feelings and a life of his own. It is remarkable how this human element is incorporated with the landscape surrounding it without either dominating or being dominated. It is as though Hokusai achieved a perfect fusion of two aspects of his art that had been developing parallel to each other - the interest in the human figure and in humanity as such, and the fresh interest in nature for its own sake that was in part a product of the intellectual atmosphere of his period. There are a few works in the series, however, in which Hokusai seems to have felt impelled to go still further to achieve a new form of landscape art. In these works man disappears from the scene completely. This group, significantly enough, includes some of the most famous works of all. It would almost seem that Hokusai had achieve some identification with the natural world in which any suggestion of human society had become irrelevant. In the "Great Wave Off Kanagawa," already mentioned above, man has almost completely disappeared, but one's chief impression from this print is, rather, of the force of nature and man's impotence in the face of it. In Thunderstorm Below the Mountain, there is still strife and shadow in the world below, thought the mountain's peak rises clear and untroubled above it. In the celebrated Red Fuji, however, all is serenity and light. This extraordinary print - superficially one of the simplest in the series - has elicited more admiration and exerted more influence on Western artists than any of the others in the series. It displays some of the characteristics of Hokusai's work in their most basic form, and it is worthwhile in conclusion, perhaps, to examine in more detail the essence of its originality. The first interesting thing is the composition, which, though not obviously eccentric as in some other prints in the series, is very characteristic of Hokusai's methods - and, ultimately, of the Japanese sensibility as such. Hokusai places the peak of the mountain at the top right of the picture, with seven-tenths of the mountain's visible width to the left, and only three-tenths to the right. On the left, there is a long, gentle slope with a great space of sky above it; on the right, the slope is cut off abruptly. One sees at work here the characteristic Japanese fondness for asymmetry. The type of rationalistic, formal symmetry to be seen in many Western gardens is not unknown in Japan, of course. this formal symmetry is evident in Buddhist temples and statues, where orderly right-left symmetry was associated with spirituality, and it also occurred in early palaces and aristocratic dwellings, where it was associated with rank and nobility. Yet throughout history this purely visual symmetry has not satisfied the Japanese sensibility. The "Red Fuji" is the most clear-cut example to be found in the series, but other instances can easily be found. In the "red Fuji", balance is restored unconsciously in the viewer's mind, which supplies the remainder of the right-hand slope and the actuality of the unseen mountainside. This love of asymmetry can be found in many other forms of Japanese art through the ages. The unconscious sense of "something lacking", and the natural urge of the mind to relieve the tension thus created by supplying what is not there, is a vital element in the dynamics of Japanese art, and one of its chief means of creating aesthetic pleasure. Secondly, the work demonstrates in its ultimate form the love of simplification and the ability to create a maximum of effect with a minimum of detail that is apparent in the other prints, too. All that is shown is the mountain and the sky above it, with its layers of fleecy white clouds moving in the gentle breeze. It is late summer. The snow which caps the mountain at other times has disappeared, save for a little still lying, unmelted, in the gullies that score the mountain's flanks. The time of day? It might be the moment when the rays of the setting sun are reflected red on Mt. Fuji's slopes, in a last blaze of glory before the mountain is transformed into a dark, mysterious silhouette. More probably, however, the print is a memory of Mt. Fuji at dawn, of that moment of silent exaltation when the sun, appearing over the horizon beyond the sea, illuminates the clouds in what, until a moment previously, was a darkened sky, and the whole peak flushes with the rosy glow of dawn. as with human beings, so with nature: Hokusai had a genius for capturing one brief, particular moment in time through the very simplest of means. Finally, the "Red Fuji" sums up another aspect of Hokusai's art which must have astonished the first Western artists who came into contact with it - his use of color. Although there are subtle gradations of color when one looks closely at the work, and despite the large patch of green at the bottom, the print relies for its chief effect on the bold contrast of two colors, the red of the mountain's flanks and the deep azure of the sky. Before Hokusai, it was an accepted artistic convention that Mt. Fuji was white, and so it was portrayed by artist after artist. Hokusai, however, defiantly showed it whatever color - red, blue, white, black - it appeared to him to be at the time. He rescued nature from prettifying, stultifying tradition and made it a matter for personal experience, something for the artist to interpret with his own sensibility. In this, he was both realistic and more than realistic. And in works such as the "Red Fuji", he was anticipating the use of color in the modern art of the West. It took even a Hokusai many years to bring his original concept to full fruition. Little need be said of a print whose boldness and originality of composition and color are still as much in evidence as ever today, more than a century after it first astonished artists in nineteenth-century Europe and America. Hokusai's wood-block prints had big influence on western artists such as Manet, Claude Monet, followed by Van Gogh. Copyright © 2008 - Present www.KatsushikaHokusai.com. All Rights Reserved.